The Evolve eBook gives you electronic access to all textbook content with plenty of added functionality. Not only can you search your entire library of eBooks with a single keyword, you can create your own customized study tool by highlighting key passages, taking and sharing notes, and organizing study materials into folders. Add additional eBooks to your collection to create an integrated digital library! Your Evolve eBooks are conveniently accessible either from your hard drive or online. 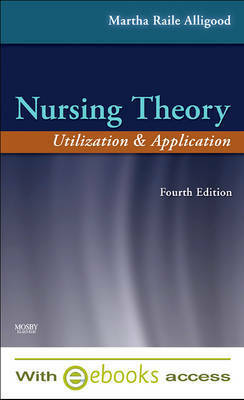 With a consistent focus on application throughout, Nursing Theory covers the development of nursing theory; the application of different nursing theories, models and philosophies; and the expansion of these practices with a look toward the future. Nursing Theory provides the opportunity for students who have learned the background of nursing theory using the companion title, Nursing Theorists and Their Work, to apply what they have learned to actual nursing practice through various patient scenarios.